The m.Stop is a tunable digital brake light modulator for increased road safety. Various blinking modes turn conventional brake lights into an eye-catching hazard light. Successive vehicles will identify the activated brakes of a leading motorcycle more quickly. A considerable plus in motorcycle safety as bikes are prone to be overlooked. This is especially true with custom bikes and models with either small or low riding brake lights. Higher end cars are already using this technology (adaptive brake lights). It is a very common aftermarket feature for motorcycles in the USA. 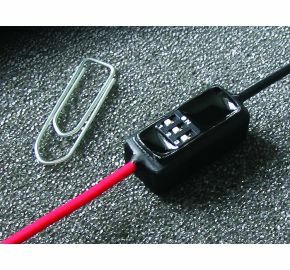 The m.Stop can also be used as a flasher relay with an automatic deactivation! If programmed accordingly, the flasher unit deactivates the turn signal(s) after 20 seconds. Say goodbye to accidental continuous turn signals!